In the 13th century, Mongol warrior hordes control most of the known world. 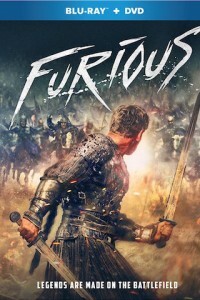 Terrified by the ruthless invaders, most of the Russian princes surrender their lands on enemy terms, until a knight leads the charge to avenge his love and his homeland in the Furious DVD. Directed by Ivan Shurkhovetskiy in his feature debut, the action-fantasy film stars newcomer Ilya Malakov, along with Alexander Ilyin Jr. (Spacewalk), Yuliya Khlynina (The Duelist), Alexey Serebryakov (Leviathan), Timofey Tribuntsev (The Monk and the Demon), Polina Chernyshova (in her feature film debut), Alexander Tsoi (Superplokhie), Igor Savochkin (The Irony of Fate 2), Andrey Burkovskiy (Kvnshchiki) and Vladimir Proskurin (Forgotten by God).